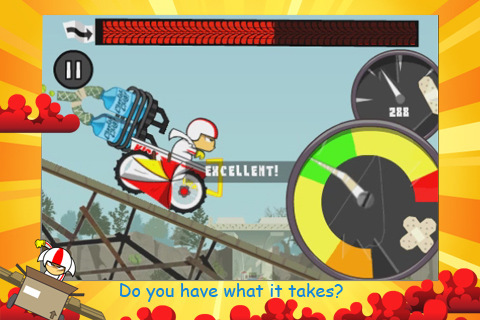 Kick Buttowski: Loco Launcho is a free app for the iPod Touch, iPhone, and the iPad developed by Disney. This iPhone app reminds me of a simplistic version of Tony Hawk games. It also reminds me of soap box derby race cars but with more of a cartoon logic behind it with soda powered nitro boosts and trampolines in midair. You play as Kick who is trying to get his vehicle upgraded while setting a record in height, distance, and WOW points. WOW points are earned by collecting stars and by doing tricks. These points are used to purchase upgrades. 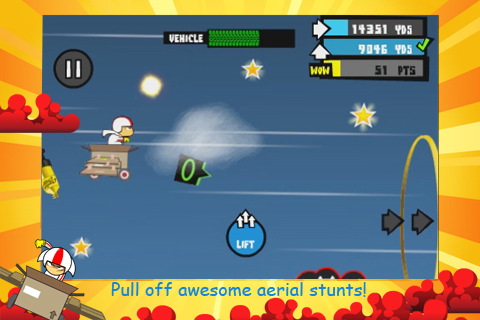 Kick Buttowski: Loco Launcho is a fun little iPhone game to pass the time. When you start a level, you will have the weakest of the race cars. It will be difficult to beat a level until you can gain upgrades. In order to move on to another level you will have to beat the previous one by reaching the required amount of points in height, distance, and WOW points. Even if you reach the requirement in one area and replay a level, you will not move on to the next level. You have to beat a level while reaching all 3 requirements to move on. Once a level starts, you’re be on a ramp and have to tap on the green wedge to increase your speed. Depending on how well you time your taps, your car will fly off the ramps if your speed is high enough. This is where the real game begins. As you soar through the sky, the atmosphere or even space, you’ll collect WOW points, power ups, do tricks and reach the level requirements. If you upgraded your car, you’ll get more points, start a level at a better height, get more boosts, have a shield and a parachute. You tap the boost, lift, and the parachute buttons to try to take your car as far as it can go. The controls are simple. They do what they need to do. There is an online feature for Kick Buttowski: Loco Launcho. I have not tried it yet but I heard you can try to get achievements. I do not know if there is a leadersboard but I assume there is especially for a game like this. The graphics are sharp and colorful like something you would see on the Disney channel or something like that. There is minor pixelation and lag but most of the time the game runs smoothly. They graphics are also informative. When you see a green ring or ramp it means one or both of those things are coming up and you should head for them. The background images are detailed. Seeing Kick flailing about when your car takes too much damage is humorous. When he finally lands on the ground Kick pumps a fist in the air. Overall the graphics are nice but are slightly overused. The audio in for for Kick Buttowski: Loco Launcho fits the theme of the game. The music makes me feel like I am going all out. The sound effects are nothing amazing and the music may feel repetitive after a while. You can turn all of this off while playing the game if you like. Kick Buttowski: Loco Launcho is a fun game though a bit repetitious. This is definitely one of those games that will appeal to a younger crowd. Kids will most likely enjoy it more since there is also a show to watch. If you play a level you basically have experienced the whole game. This is not a game for everyone but it is amusing and somewhat funny. AppSafari review of Kick Buttowski: Loco Launcho was written by Tony Lau on February 25th, 2011 and categorized under Action, App Store, Free, Games. Page viewed 8411 times, 2 so far today. Need help on using these apps? Please read the Help Page.